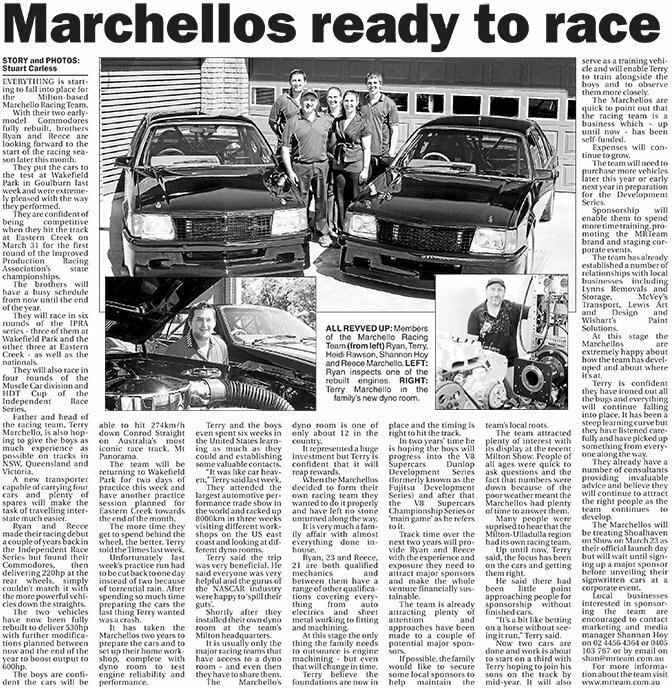 EVERYTHING is starting to fall into place for the Milton-based Marchello Racing Team. With their two early-model Commodores fully rebuilt, brothers Ryan and Reece are looking forward to the start of the racing season later this month. They put the cars to the test at Wakefield Park in Goulburn last week and were extremely pleased with the way they performed. They are confident of being competitive when they hit the track at Eastern Creek on March 31 for the first round of the Improved Production Racing Association's state championships. The brothers will have a busy schedule from now until the end of the year. They will race in six rounds of the IPRA series - three of them at Wakefield Park and the other three at Eastern Creek - as well as the nationals. They will also race in four rounds of the Muscle Car division and HDT Cup of the Independent Race Series. Father and head of the racing team, Terry Marchello, is also hoping to give the boys as much experience as possible on tracks in NSW, Queensland and Victoria. A new transporter capable of carrying four cars and plenty of spares will make the task of travelling interstate much easier. Ryan and Reece made their racing debut a couple of years back in the Independent Race Series but found their Commodores, then delivering 220hp at the rear wheels, simply couldn't match it with the more powerful vehicles down the straights. The two vehicles have now been fully rebuilt to deliver 530hp with further modifications planned between now and the end of the year to boost output to 600hp. The boys are confident the cars will be able to hit 274km/h down Conrod Straight on Australia's most iconic race track, Mt Panorama. The team will be returning to Wakefield Park for two days of practice this week and have another practice session planned for Eastern Creek towards the end of the month. The more time they get to spend behind the wheel, the better, Terry told the Times last week. Unfortunately last week's practice run had to be cut back to one day instead of two because of torrential rain. After spending so much time preparing the cars the last thing Terry wanted was a crash. It has taken the Marchellos two years to prepare the cars and to set up their home workshop, complete with dyno room to test engine reliability and performance. Terry and the boys even spent six weeks in the United States learning as much as they could and establishing some valuable contacts. "It was like car heaven," Terry said last week. They attended the largest automotive performance trade show in the world and racked up 8000km in three weeks visiting different workshops on the US east coast and looking at different dyno rooms. Terry said the trip was very beneficial. He said everyone was very helpful and the gurus of the NASCAR industry were happy to 'spill their guts'. Shortly after they installed their own dyno room at the team’s Milton headquarters. It is usually only the major racing teams that have access to a dyno room - and even then they have to share them. The Marchello's dyno room is one of only about 12 in the country. It represented a huge investment but Terry is confident that it will reap rewards. When the Marchellos decided to form their own racing team they wanted to do it properly and have left no stone unturned along the way. It is very much a family affair with almost everything done in-house. Ryan, 23 and Reece, 21 are both qualified mechanics and between them have a range of other qualifications covering everything from auto electrics and sheet metal working to fitting and machining. At this stage the only thing the family needs to outsource is engine machining - but even that will change in time. Terry believe the foundations are now in place and the timing is right to hit the track. In two years' time he is hoping the boys will progress into the V8 Supercars Dunlop Development Series (formerly known as the Fujitsu Development Series) and after that the V8 Supercars Championship Series or 'main game' as he refers to it. Track time over the next two years will provide Ryan and Reece with the experience and exposure they need to attract major sponsors and make the whole venture financially sustainable. The team is already attracting plenty of attention and approaches have been made to a couple of potential major sponsors. If possible, the family would like to secure some local sponsors to help maintain the team's local roots. The team attracted plenty of interest with its display at the recent Milton Show. People of all ages were quick to ask questions and the fact that numbers were down because of the poor weather meant the Marchellos had plenty of time to answer them. Many people were suprised to hear that the Milton-Ulladulla region had its own racing team. Up until now, Terry said, the focus has been on the cars and getting them right. He said there had been little point approaching people for sponsorship without finished cars. "It's a bit like betting on a horse without seeing it run," Terry said. Now two cars are done and work is about to start on a third with Terry hoping to join his sons on the track by mid-year. It will also serve as a training vehicle and will enable Terry to train alongside the boys and to observe them more closely. The Marchellos are quick to point out that the racing team is a business which - up until now - has been self-funded. Expenses will continue to grow. The team will need to purchase more vehicles later this year or early next year in preparation for the Development Series. Sponsorship will enable them to spend more time training, promoting the MRTeam brand and staging corporate events. The team has already established a number of relationships with local businesses including Lynns Removals and Storage, McVey's Transport, Lewis Art and Design and Wishart's Paint Solutions. At this stage the Marchellos are extremely happy about how the team has developed and about where it's at. Terry is confident they have ironed out all the bugs and everything will continue falling into place. It has been a steep learning curve but they have listened carefully and have picked up something from everyone along the way. They already have a number of consultants providing invaluable advice and believe they will continue to attract the right people as the team continues to develop.